A bunch of artists who get together once a year to copy a famous work by a well-known artist? "Ripping off a dead artist"? Whose idea was this, anyway? It began in 2007, with two artist friends in Oliver, BC, fibre artist Terry Irvine and Marion Trimble, who does mixed-media collage. They invited artists they knew to join them in interpreting one famous work of art, each in their own medium. The group chose Vincent Van Gogh's "Wheatfield with Cypresses, Early September 1889." The first challenge was a single day, from 9 am to 3 pm. The following year, the artists from the Van Gogh challenge chose "Portrait of Emilie Floge" by Gustav Klimt as their second challenge and changed their name to The Klimtomaniacs. By the third year, they knew the challenge was an established entity and called the group The Ripoff Artists. The theme for 2009 was "Pink Tulip" by Georgia O'Keeffe. In 2010, they chose "Mount Lefroy" by Lawren Harris of the Group of Seven. For their fifth anniversary in 2011, They chose American Gothic by Grant Wood, but decided to switch things up a bit and make it more challenging. Each Ripoff Artist had to interpret the painting in the style of another artist. Since then, the challenges have taken on some added complexity: adding colour to a black and white original, hiding the year somewhere, using geometric shapes to render the entire piece. The challenge has expanded to fill a week during the summer, at the Quail's Nest Arts Centre in Oliver, BC. Artists do prep work at home, then bring their piece to the Quail's Nest to work on during the week. Saturday is still the big day, when pieces are completed to a specified point (not all mediums allow the work to be done in a week), and displayed. Finished pieces are then displayed at the Fall Art Show in conjunction with the annual Festival of the Grape (part of the Okanagan Wine Festival), and have been featured at Leir House in Penticton and private galleries such as Handworks in Oliver. Members of the group meet several times during the year to select the artwork they will "rip off" that year, and to assign tasks such as publicity and booking the venue. Membership in the group is by invitation. 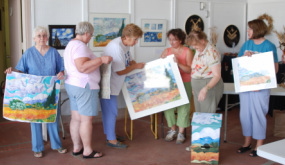 Members find they learn something every time they get together, about the artist they've chosen to study, their own medium or what other artists see or know. Trying to emulate the work, style, technique, artistic philosophy of another artist using their own medium forces each member to go beyond their normal comfort zone and challenge themselves. One of the members says this is "the most fun thing I've ever done." The RipOff Artists encourage you to rip off their idea of "ripping off a dead artist" with artists in your own community!